Spotted Owl Games is running a Kickstarter campaign for Untold Dungeons, their terrain mat for RPG gaming. 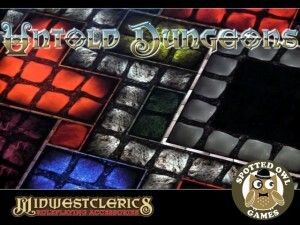 Bring your medieval RPG to life without breaking the bank with the UNTOLD DUNGEONS reusable dungeon mat and tile set from Midwest Clerics and Spotted Owl Games. Stop using low quality flip mats, map packs, or tiles sets. Flip mats have creases which make it difficult to keep flat when in use while map packs and tile sets are difficult to keep arranged on a crowded game table. The UNTOLD DUNGEONS reusable dungeon mat comes with a double sided dungeon mat featuring a unique lay out on each side as well as dozens of scenery tiles including doors, book shelves, fire places, wardrobes, tables, torture devices, treasure and trap tiles.